These flashlights shine above the rest. It is a parent’s job, among many other things, to banish darkness, dispel fears, and shed light on unknowns. That’s why all parents should have a sturdy, reliable flashlight. But finding the best flashlight for camping, games, or everyday use isn’t easy — there are a range of flashlights, lanterns, and headlamps, and your specific needs should inform that which you ultimately select. For those that want the ultimate power, there’s no beating a traditional flashlight, whether from disposable or rechargeable batteries. For those that need both their hands (and markedly less light), a headlamp, long a favorite among outdoorsmen, is a great option. And then there are lanterns, which require no hands but are most useful when you’re not going far. We offer our favorites in each category to make your decision that much easier. Maglite is a brand trusted by first responders across the country for the past 40 years. 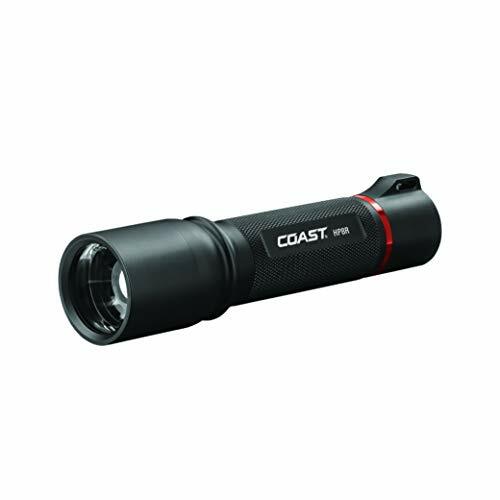 It’s easy to see why: The solid aluminum body screams ruggedness, while the heavy weight of the flashlight in your hand adds to the sense of security when the lights go out. It’s simple and, like black coffee and neat whiskey, simple can be great. 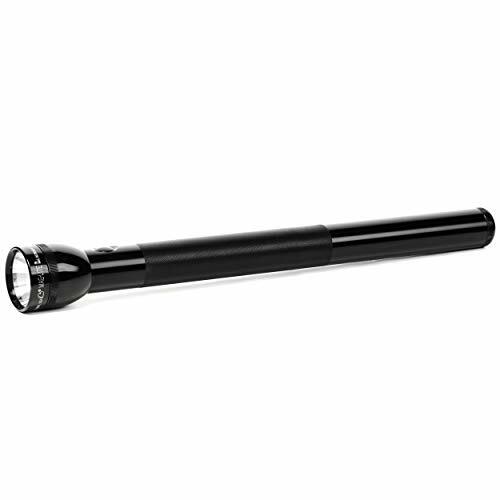 Pros: Machined in the U.S. from anodized aluminum alloy, the flashlight is weather-sealed and features an adjustable beam width. There’s also the heft: At over 19 inches and weighing in at more than three pounds thanks to its six D batteries, this gives it other uses, such as whacking stubborn bolts, flattening spiders, and popping beer bottles. Cons: Its size and weight can be overkill, particularly if you’re going to be schlepping your flashlight around for a while. Plus, its batteries, like any other’s, can run out, leaving you with a three-pound baton useful only in leading a noontime parade. It’s also water-resistant, not waterproof, so it’s not a great choice for the wettest of conditions. A headlamp allows you to use all 10 fingers to work while pointing a light at what they’re manipulating. Whether that’s changing a tire on the side of the road, searching for the breaker box, or hiking back to the car at dusk, a headlamp is an essential piece of gear. Pros: Weatherproof and with multiple strength settings, the LED tiny wonder flashlight can put out an impressive 300 lumens of pure white LED. For the outdoorsman, it also has a red-light setting, which helps preserve night vision. And while there are many other headlamps with more features, we love the Black Diamond Spot Headlamp because it’s a wonderfully executed example of the category that’s also affordable. And for what it’s worth, it does offer proximity and distance modes, one-touch dimming, and strobe functionality. Cons: Three AAA batteries are less convenient than the USB-rechargeable batteries you can find on other models. It’s our only qualm with an otherwise perfect, reliable product. Lanterns have been a camp lighting staple for generations, but we’ve moved far from the kerosene reservoir, glass lanterns of old. 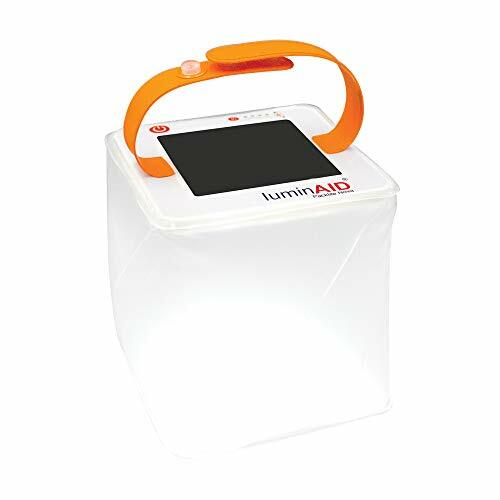 The LuminAID lantern packs plenty of modern tech, an LED light and both USB port and solar panel for recharging, into a compact cube. It weighs just five ounces, so it's easy to bring along no matter where your adventures take you. Pros: Once fully charged (approximately 10 hours of direct sun or via a USB port), the flashlight unit will stay lit for up to 50 hours. When not in use, its translucent plastic sides collapse for easy storage of the pancake-sized unit. It floats and is dust- and weatherproof. Bonus: With every unit sold, one is given to someone in the developing world. Cons: With a total output of 75 lumens, you won’t be turning night into day with this thing. Furthermore, while its five-ounce weight makes it great for backpacking, one strong breeze can send it down a ravine, so make sure it’s secured before you hit the trail. Whether you’re searching for a lug nut on the side of the road or joining a search-and-rescue operation, a good spotlight is worth having on hand. 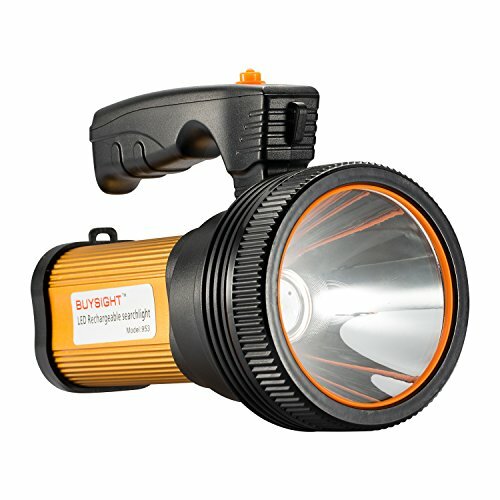 Buysight’s rechargeable flashlight is affordable and has multiple secondary uses, and its primary output of 6,000 lumens is strong enough to bring down low-flying aircraft. Pros: First and foremost, it’s the power. This flashlight is about as close to a light saber as we’ll get in our galaxy, a beam that can light up a half-mile wherever it’s pointed But we also really liked this light’s ability to act as a powerbank to charge devices via its USB. When the unit itself is dead, just plug into a wall outlet with an included charger. Cons: Big and bulky, this isn’t a light you’re going to carry in a bag, and it will get in the way until you actually have to use it. Looking for an everyday carry option? Keep looking. 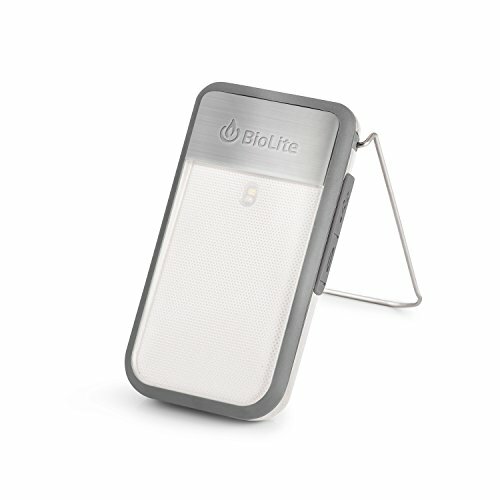 Versatility is the key appeal for the BioLite PowerLight Mini, which can be used as a charger, headlamp alternative, lantern, and bike light. All of this in a package the size of a credit card. Pros: This flashlight is just handy, engineered to be as useful over as many areas as possible. The clip stand works as either a kickstand for your light—perfect on a nightstand—or a clip to affix the light to your backpack for a ride home. For these multiple uses come multiple lighting modes, with a max output of 135 lumens for up to 52 hours. Cons: Versatility comes at the cost of excellence in any one area. The lumen output is quite low compared to other dedicated lights on this list alone. 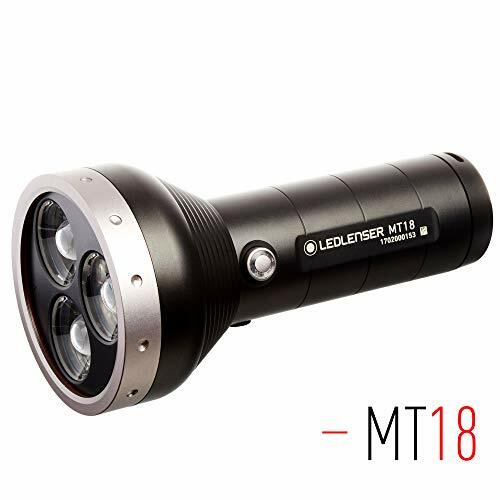 The Ledlenser MT18 is an amazing flashlight, with tons of lighting power in a package that, at less than seven inches long and about 1.4 pounds, is still easy to carry around. That excellence will cost you, however, which is the main reason you should pause before picking one up. Pros: A blinding 3,000-lumen output can adjust from a focused beam to floodlight with the push of a button. Its enormous, USB-rechargeable battery supplies up to 96 hours of light, and you can quick-charge it to 80 percentin four hours. Cons: Only the price made us think twice. Will you notice a difference in package and performance by paying 200 bucks? Sure you will. Is it important enough of a difference? You’ll need to decide that for yourself. This flashlight has a bulls-spot beam, which projects a focused beam of light that makes it perfect for seeing things at a distance. Pros: With this flashlight, you can shift between a wide flood beam or spot mode with transition halo at varying distances and brightness. The flashlight operates on both rechargeable and alkaline batteries so you never lose power. It’s got a durable aluminum body for a one-meter drop protection. Cons: Some say it has trouble holding a charge.